Big enough for any task, but small enough to carry everywhere, Apple’s iPad Pro is a tablet marvel. With the Apple Pencil, it becomes a full-fledged canvas to draw, paint or write. To easily carry the two together, look no further than Speck’s StyleFolio Pencil case. We’ve designed the perfect case to hold both the iPad Pro and the Pencil. Now available for the iPad Pro 12.9-inch and iPad Pro 9.7-inch, StyleFolio Pencil keeps your iPad and Pencil safe and comes with several awesome extras. Open up this iPad Pro Pencil case and you’ll see a dedicated holder for your Apple Pencil, so it’s always there when you need it. There’s a handy scoop the helps you easily lift the Pencil out of the cradle.While you’re writing or drawing with the Pencil, you can rest it in the StyleFolio’s unique inkwell. It grips the Pencil’s point to stand it up so you can easily grab it. When you’re done using your Pencil, simply press it gently back into the holder. 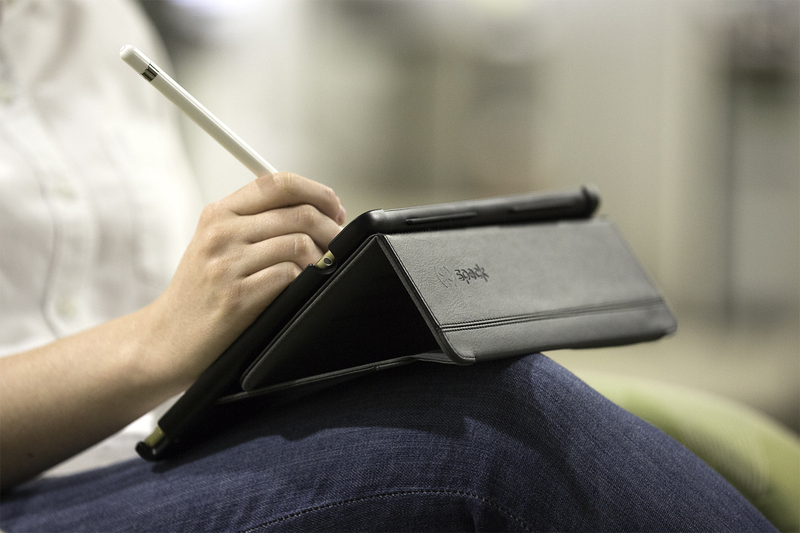 This sleek folio case wraps around the front and back of the iPad with a soft lining. The case’s front flap completely covers and protect the iPad’s screen and magnets embedded in the flap automatically wake and lock the iPad when you open or close it. The stand props up your iPad so you can comfortably type or draw and watch videos at the perfect angle. On the sides of the StyleFolio, carefully-designed speaker scoops protect the edges of the iPad and also project sound towards you when watching videos or listening to music. We designed the StyleFolio to completely surround your iPad Pro to offer the best protection, while making sure we didn’t compromise the speakers. If you’re shopping for an iPad Pro Pencil case, we’ve got the perfect match. Pick one up from Speck, but hurry, because these popular cases are disappearing fast.